Zhao Yun can discard X hand cards. For the rest of the turn, his attacks and duel will cause 1+X damage to players with hand cards. At his next drawing phase, his general card is out of the game. Whenever Zhao Yun attacks anyone, that player's armor is ineffective. Whenever Zhao Yun is at brought to the brink of death, he can choose any other player to recover three health. 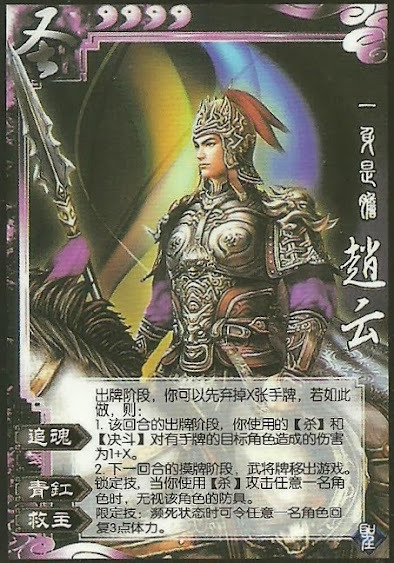 If Zhao Yun uses "Deception" and causes damage to a player without any hand cards, that damage is just the normal amount. "Black Pommel" is the same as the weapon Black Pommel. Zhao Yun cannot choose himself or anyone with full health when he uses "Savior".